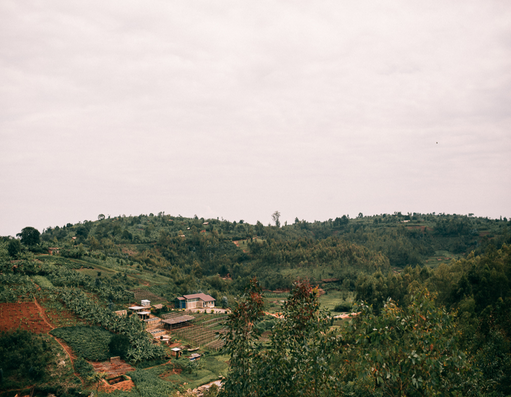 Nestled deep within the heart of the small coffee producing country of Burundi, on the border of the northern Kayanza Province, is the village of Bukeye. Bukeye bustles with all the activity of village life that spills to the very edge of the main road. People sewing garments on foot pedal machines, selling beans and potatoes from sacks, hanging freshly butchered goats for the noon meal and repairing bicycles with one tool. Just beyond this village, down a dirt road lined with trees lies Bukeye washing station. Bukeye is a place of innovation. It was here that the CCC coffee scout program was piloted. The scouts, together with our agronomists, have been pivotal in increasing the quality of our coffee through innovative methods and programs. The washing station has been the launching pad for an extensive organic pesticide program targeting antestia (the colourful critter linked to the potato defect), post-harvest pruning, mulching and fertilizing campaigns. Conditions: Bukeye’s high altitude, moderate climate and close proximity to the Kibira rainforest bring out the potential in each bean. The individual micro-climates of each hill combined with the station’s ideal conditions guarantee unique and exquisite notes in every cup. Employees (2018): Bukeye has over 160 committed employees, most of whom call the surrounding coffee hills home. They work tirelessly in and out of season to produce the best quality coffee possible. Head of Security: Omer Nsavyimana. Omer works together with 5 guards who are dedicated to ensuring security at the washing station, day and night. Water source: Bukeye washing station has its own borehole water source and a granite-filtered well, ensuring only clean and natural water is used to pulp, ferment and wash the coffee. Processing style: The Bourbon coffee processed at Bukeye is available in four styles. Fermentation, washing, grading, footing and soaking: Coffee at Bukeye undergoes two types of fermentation– single and double. For single fermentation, parchment spends 12 hours in fermentation tanks without water after which it is rinsed in clean water and graded. It then spends 4-6 hours in soaking tanks before being taken to the pre-drying tables. For double fermentation, parchment spends 12 hours in fermentation tanks without water and then 12 hours in fermentation tanks with water. The coffee is then “footed” by a group of workers who stompon the coffee for 15-20 minutes while singing their stomping-songs. The footing is to remove mucilage from the parchment; the singing is to give them the energy to do it. It is then rinsed in clean water in the rinsing channels to increase the density, quality and cleanliness of the beans before being left in the final soaking tanks for 4-6 hours. After this, it is taken to the pre-drying tables. Six fermentation tanks are available for single or double fermentation depending on roaster preference. Pre-drying and Drying: Bukeye station has 3 double pre-drying tables and 142 drying tables ranging in length and level designed to regulate drying times. 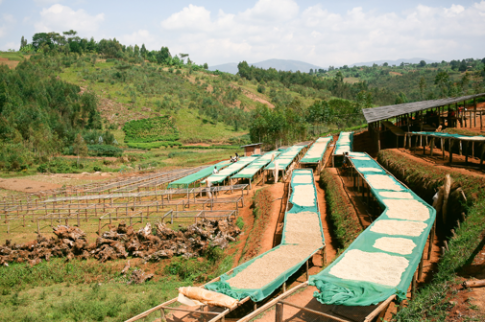 Coffee parchment spends 2 days on pre-drying tables where it hand-picked for defects. This is a critical step to remove cherries that are under ripe, over ripe or have insect damage that is only possible when the parchment is wet. The coffee parchment is moved to traditional African raised tables when the internal moisture reaches an optimal level of 45%. Parchment is removed from the dry- ing tables when internal moisture reaches an optimal level of 10.5%. Commitment to the perfect moisture level means coffee spends 20-30 days slow-drying, depending on the weather conditions. Farmer card system: During the peak of harvest, over 2200 farmers bring their cherries to the station and each person’s contribution is recorded using a farmer card system. This system ensures that CCC can trace the best quality coffee and the farmers who grow it right down to hill-level. Harvest period and roaster visitation schedule: Coffee collection usually begins in April and by the end of June the last of Burundi’s best cherries arrive at the station.